Manufactured in Grande-Bretagne from 1986 until after 1986. The Image cameras correspond to the Spectra denomination (range presented at the European press in 1986) used on certain national markets, like that of the USA. 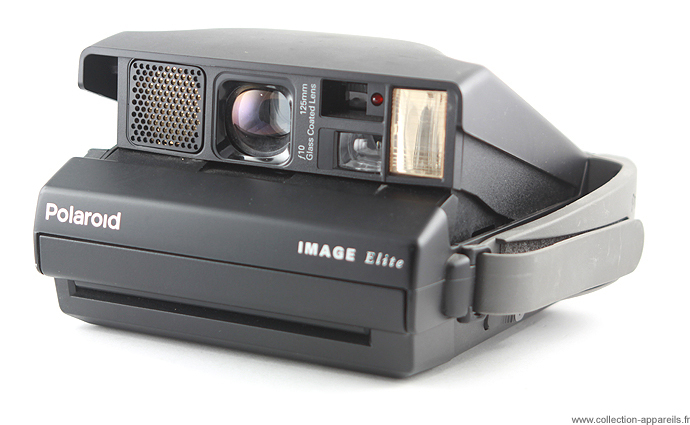 Image Elite and Elite Pro positioned like the tops of Polaroïd range at their time (it seems that the production was stopped in 2000). When the camera is not used, it can be closed completely like a shell. The principle is that already used for mythical Sx-70. Image is however much thicker. The principle of closing/aperture of Image is much easier than that of its groin, and as well less fragile. Only one button, located on the left side, under the handle, makes it possible to open (and close) the camera. Once opened, there are no more visible bellows or metal parts. The aperture starts the setting according to the camera. To the back, on the “dashboard”, a green diode indicates that all is avoided for the photograph. This “dashboard” is enough impressing when we know the spartan simplicity of other Polaroid. One finds there a cursor (requiring the use of the point of a pencil to be moved) which makes it possible to choose between a posting of the distances in the finder (by diodes) in meters or feet. The other cursors can be actuated with the finger. They allow to choose the emission or not of sounds of alarm, to start a self-timer, to stop the flash (which if it is triggered with each photo), to vary between the usual Darken / lighten Polaroid, to use or not the sonar autofocus. In the first case, the distances are displayed in the viewfinder. In the second, the setting is set to infinity, imposing a minimum shooting distance of 15 feets. This device is useful for shooting through a window, for example. Image Elite Pro allows many other settings of exposure etc… In its case, the “dashboard” to buttons is replaced by a LCD screen with menus. A series of accessories could supplement Elite and/or Elite Pro: cap, remote control etc… These cameras, from their quality and because of the advantages of the instantaneous photograph equipped the American and English police forces.